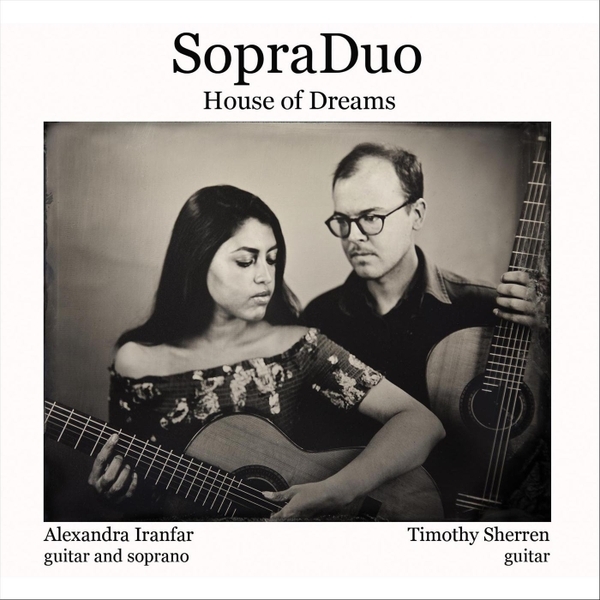 SopraDuo is the name of the duo of guitarist Timothy Sherren and soprano Alexandra Iranfar, who also plays guitar. The group was formed when both of them were students at the San Francisco Conservatory of Music (SFCM); and they originally honored their “home base” by calling themselves One Great City. The transition to the new name seems to have taken place in conjunction with the release of their second CD, currently available only in download form from Amazon.com, several months ago. The title of the CD is House of Dreams; and it consists entirely of new compositions, collected through a collaboration with the Guerrilla Composers Guild (GCC). GCC was founded in San Francisco in 2012. Both of the founders, who are still the co-directors, were SFCM Composition students at the time. Both of them are now composers whose names should be familiar to those who read this site regularly: Nicolas Lell Benavides and Danny Clay. SopraDuo is the latest of several chamber music groups that have organized concerts and recordings around pieces written for them by GCC composers. Benavides himself is one of those composers on House of Dreams; and the others are (in order of appearance on the track listing) Michael Kropf, Eric Choate, Emma Logan, and Shahab Paranj. Only three of the selections on the CD involve Iranfar’s vocal work, but one of them amounts to a song cycle in miniature. This is Emma Logan’s Songs for Sara, setting three poems by Sara Teasdale with an instrumental interlude between the second and third poems. The opening track is Benavides’ “Where everything is music,” setting a text by Rumi in an English translation by Coleman Barks. The remaining vocal selection is Choate’s setting of Edgar Allan Poe’s poem “A Dream Within a Dream.” Each of these texts is delivered with a rhetoric of intimacy, which is well served by each of the composer’s ability to create musical evocations of quietude. Those evocations extend into the guitar duos as well. Paranj contributes two short pieces, each of which involves contemporary instruments reflecting on ancient Persian traditions. On the other hand Kropf’s contribution comes across almost as a setting of a poem that has not yet been written. That impression is reinforced by his selection of the title “A Small Picture of a Large Place.” Finally, the album concludes with Benavides’ “For Max and Hannah,” which serves as an instrumental “bookend” with fragments of vocalization to complement the opening setting. Taken as a whole the album offers a little more than 45 minutes of sensitively conceived stillness, which will be most welcome to those who feel as if everyone is shouting at us from every conceivable direction.